At the risk of coming off like a sourpuss, let me say this: I hate Valentine's Day. No, that’s not true. What I despise is the retail spin, the emphasis on expensive dinners and overpriced roses. Too much pressure! So unoriginal! If I abhorred the spectacle when I was sans boyfriend, I find it even more loathsome as half of a couple. And I’m not just saying that because I'm holding out for a Tiffany diamond-studded heart key. Really. For me, romance can’t be squeezed into a single over-commercialized holiday, celebrated in the same manner as a gazillion other couples. Sorry, Cupid. Point your arrow elsewhere. When I peel back the cloying merchandise frenzy, however, to the soft dark-chocolate center, I find numerous pastimes for marking this essentially sweet day: Decorating cookies and cupcakes with the kids. Making truffles and candy to give away. Cooking a low-key, albeit special, meal that begins with a unabashedly pink cocktail and ends with a heart-shaped cake. I adore the homemade love notes and little gifts of chocolate proffered by my kids and hubby; I am eternally charmed by the unexpected. 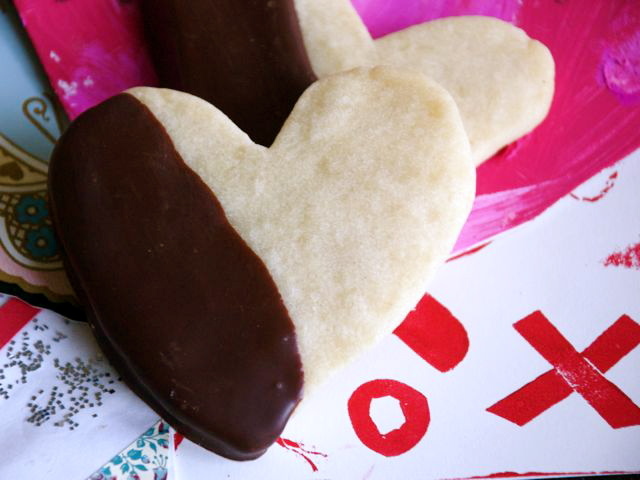 Here are eight easy-to-digest ideas for keeping Valentine's Day sweet. #(clear n2). [%image cocktail float='clear right' width=350 caption="The Tifozi, from the book 'Speakeasy.'"]Cocktails. 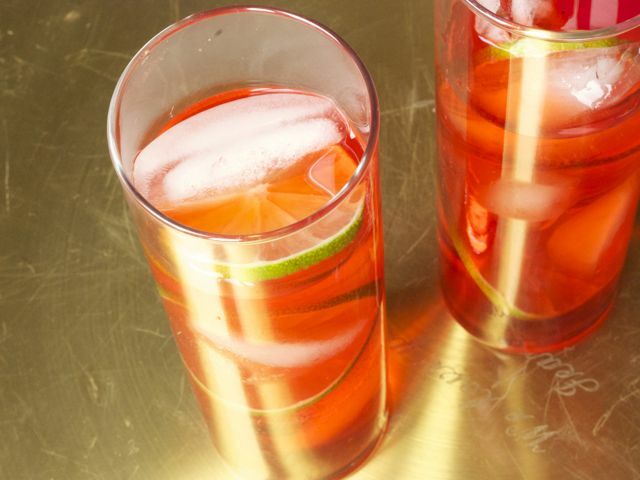 Shake it up with a bevy of pink drinks, nary a Cosmopolitan. If you like Campari, start the evening with a Negroni, a bittersweet drink for a semisweet valentine, or Tifozi, a riff on the Americano from a new book on cocktails, Speakeasy. Otherwise, uncork a bottle of bubbly for a Prosecco Cocktail. Or turn blood oranges, while they're still in season, into Blood Orange Cocktails. Rose-tinted glasses not needed. #(clear n3). 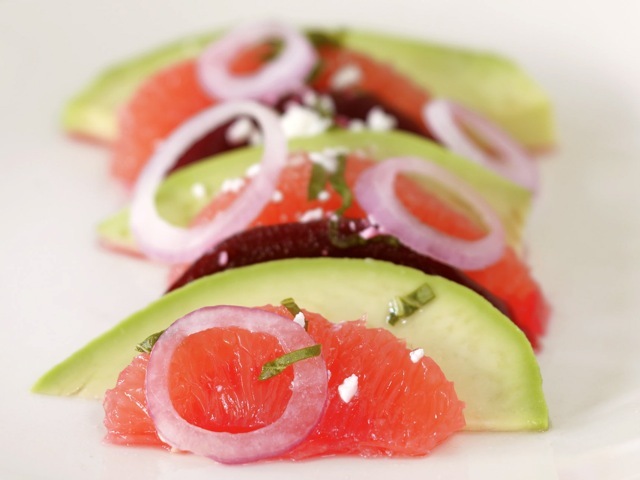 [%image beetsalad float='clear right' width=350 caption="Beet and Avocado Salad with Sparkling Lime Vinaigrette. "]Beet red. I adore beets and will happily buy into color-themed holidays if it means beets are on the menu. Gorgeous fuchsia color, sweet-tasting, candy for the colon — what's not to love? Center stage: Serve bowls of Beet and Greens Pasta or Vegetarian Borscht. On the side: Say "U R Special" with a Beet Salad with Goat Cheese and Toasted Walnuts  or Beet and Avocado Salad with Sparkling Lime Vinaigrette. #(clear n4). 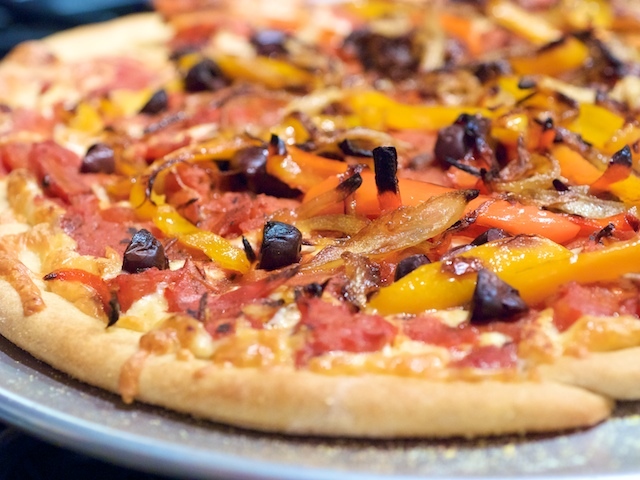 [%image pizza float='clear right' width=350 caption="Pizza with Red Peppers and Black Olives. "]Heart-shaped pizza. It's cheesy, I know, but such an easy A. Make one big pizza, or several small individual ones. House favorites include Pizza with Red Peppers and Black Olives and Bacon-Jalapeño Pizza. On Valentine's Day, however, I'll splurge on Fra' Mani sopressata and fresh mozzarella. After all, expensive salami pales in comparison to a side of beef for two served in some fancy restaurant where the waiter is pining for anything but a deuce. #(clear n5). [%image truffles float='clear right' width=350 caption="Chocolate Truffles. "]Chocolate truffles. I wholeheartedly endorse the practice of giving chocolates on Valentine's Day, and any other day, too. Random acts of chocolate kindness know no bounds. Homemade truffles are a cinch to make; start with this recipe for Chocolate Truffles, then branch out, experimenting with flavors by infusing cream. Earl Grey tea, coffee beans, or chopped hazelnuts marry beautifully with chocolate. 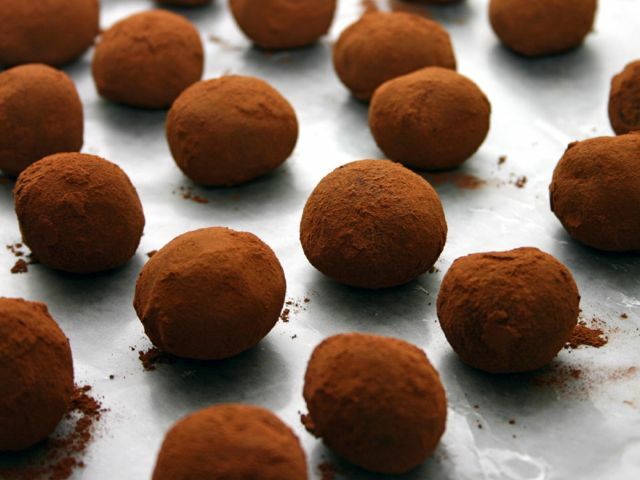 Champagne goes nicely alongside truffles, and inside too: see Easy Champagne Chocolate Truffles. #(clear n6). [%image muffins float='clear right' width=350 caption="Cocoa-Banana Muffin. "]Love muffins — and cupcakes. Bake sales, refreshments for the dance, kid or office parties, and potlucks all cry out for a tray of cupcakes. Everyone loves Black Bottom Cupcakes and they're a breeze to make. You can turn any cake recipe into cupcakes, then have the kids frost and festoon to their hearts' desire. For a more elegant repast, bake and ice White Chocolate Cupcakes with White Chocolate Frosting. 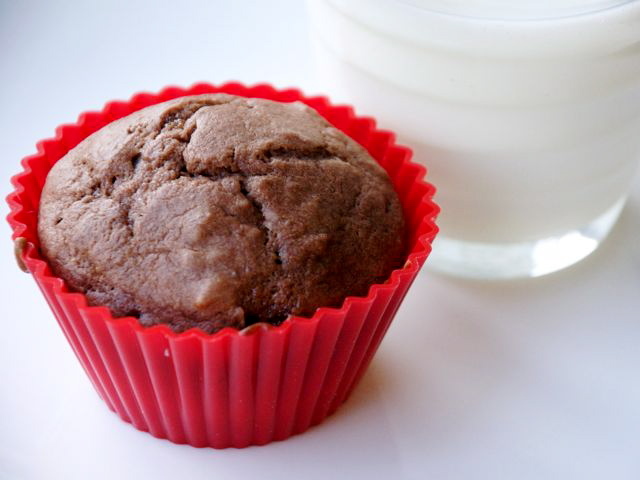 For breakfast or snacks, try Cocoa-Banana Muffins. #(clear n7). [%image cake float='clear right' width=350 caption="Chocolate Mocha Cake with Irish Whiskey. 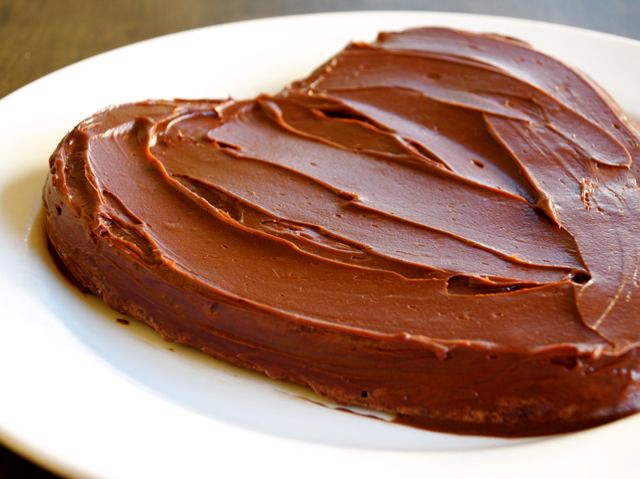 "]I "heart" cake. A heart-shaped cake, I realize, embraces heart-shaped Valentine mania. But consider this: Chocolate Mocha Cake with Irish Whiskey. Whether you take it to a party or serve it solely to your one-and-only-o, it's pure love. Same pan, less boozy? Try Red Velvet Cake or Devil's Food Cake, topped with chocolate ganache, fluffy seven-minute, or cream-cheese frosting. #(clear n8). 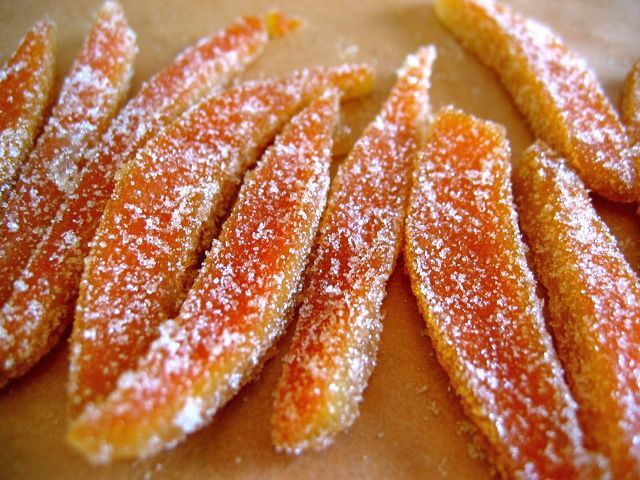 [%image candy float='clear right' width=350 caption="Candied Citrus. "]As sweet as candy. Noting really beats the little conversation hearts in a box, it's true. Absolutely no natural ingredients, but so very cute with type-face endearments. That said, I'd rather give and receive something I'd like to eat — Candied Citrus Peel dipped in chocolate, or Homemade Marshmallows, tinted pink and scented with rosewater, or Black Dates with Rose Almond Paste — with my own love note attached. p(bio). Carrie Floyd is the recipe editor and a co-founder of Culinate. She's also a sweetheart.